The goal of this post is to fetch WordPress content and place it with in our ‘home page’. This is shown in the image below. 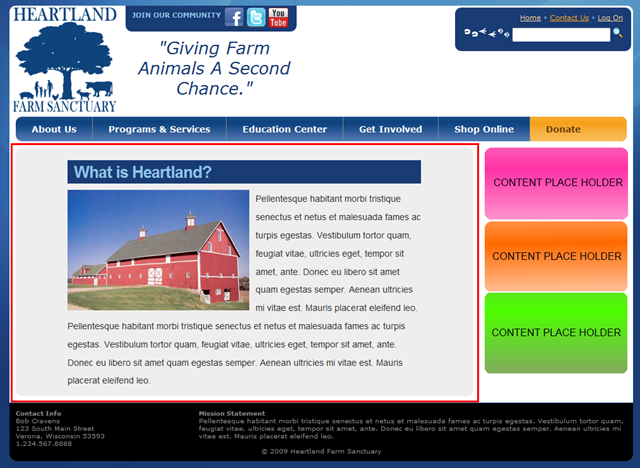 The content surrounded by the red square is stored by WordPress but is being rendered in our page. The issue with viewing is in WordPress is that we are navigated away from our ‘home page’ to a page that looks like a blog. We could theme up our blog to look like our ‘home page’ but that seems like a waste of time. Besides, for the site blog I want it to have more of a blog feel. To have a ‘home page’ for the web site that provides a platform for extension. For this reason, I chose to have an ASP.NET MVC front end. To allow the end user (not me) to generate content for the web site. I cannot continue to do new things if I have to heavily support the application by generating content. The last point is an important design consideration. I really do not want to generate site content. I much prefer to develop the site framework and add new site features. This requires that the design empowers the end user to do this for themselves. Most end users are not as technical as developers, so this would fail miserably if we don’t provide the right tooling. The WordPress blog engine is quite mature and stable. It is also supported by my hosting environment. Many sites use WordPress as their ‘home page’. Because of WordPress’ maturity, there exists a lot of tooling to enable users to easily create content. Although WordPress is very extendable (via plugins), the server side code is PHP. Nothing wrong with PHP, at this time it is just not high on my skill set. WordPress can save content in two formats: post and page. A post is simply a new entry in the blog. 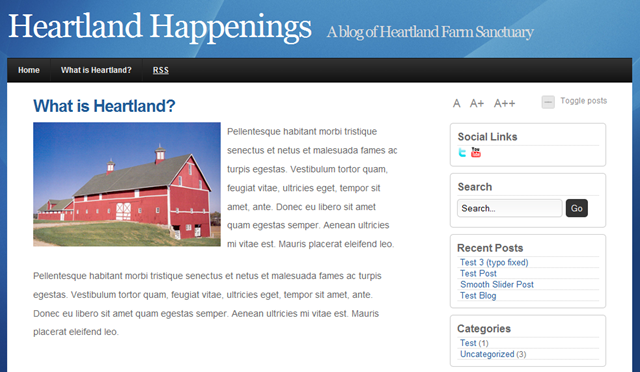 A page is equivalent to a post, except it stand alone and is not shown in the blog. Our site will have a number of these stand alone pages that will be accessed via our ‘home page’. WordPress actually saves both ‘post’ and ‘page’ content to the same database table. The underlying implementation uses a database field to distinguish between the two. Content Database – Because WordPress is a blog engine, it can store post / page content. This is a real time saver in the design. Imagine if I had to develop my own content database. Blog Engine – The site’s blog will use WordPress. This falls right into WordPress’ strengths. Theme – You can select from thousands of free WordPress themes. Plugins – You can extend the WordPress by installing free plugins. These plugins add features to the blog engine. For instance you can add Akismet (anti-spamming), CAPTCHA (are you human) and Twitter Widgets. Code – You can also modify CSS, HTML and PHP to create the ultimate WordPress site. The one plugin that is required in this post is the “Reveal IDs for WP Admin” plugin. This plugin reveals the page / post IDs (normally hidden) on the admin page. These will be used later to query for page / post content. Most blog engines support some sort of API that can be used to programmatically access and add content. WordPress supports the XML-RPC communication protocol. XML-RPC is a communication protocol that allows software running on disparate operating systems to make calls over the internet. It’s remote procedure calling using HTTP as the transport and XML as the encoding. MetaWeblog application programming interface allows external programs to get and set text and attributes of weblog posts. MetWeblog API is built on top of the XML-RPC communication protocol. There already exists .NET wrapper around the XML-RPC protocol. The one most commonly used was created by Charles Cook and can be download here. WordPress has extended the MetWeblog API with their own WordPress API. Once again there already exists a nice WordPress wrapper created by Alex James Brown called Joe Blogs. After completing this implementation I realized that the XML-RPC code that Charles Cook developed uses .NET reflection. So this solution will not work in my medium trust deployment environment. This is great example of why we should code to interfaces. I will be working on an implementation of the IWordPressRepo interface that does work in medium trust. I will post that implementation at a later time. In the code below I will be using these two libraries to interface with WordPress. Instead I will be implementing some code to directly query the database (see database section below). Having an interface is key to allowing the controller to be tested using a fake instance of the IWordPressRepo interface. In addition this interface encapsulates the implementation of the XML-RPC / MetaBlog interface. If a better API is introduced by WordPress, our code changes are isolated to the concrete implementation of the IWordPressRepo interface. As noted above the following implementation will not work in a medium trust environment. I will keep the code in the blog post for those who can use it. If you are deploying to a medium trust server, you should use the database implementation described in the next section. // Word press exception. Stuff in some diagnositics. The above repository leverages the “WordPressWrapper” that can be found in the Joe Blogs code. The constructor of the repository instantiates an instance of the “WordPressWrapper” object. Then two methods fetch either the post or page data. These two methods are almost identical except for the method called on the “WordPressWrapper” object. A bit of error handling is introduced to take care of the cases where the call to the “WordPressWrapper” method throws an exception. Finally, the WordPress data is repackaged into our model object and returned. For what I need to do, the above code is less complex and easier to maintain than the XML-RPC / Joe Blogs code. There was a lot of code under the hood of those libraries that can be replaced by the code above. One side effect of using the above code is that I will need a local copy of my WordPress database for development. The database hosted by GoDaddy cannot be accessed from the outside. The blog configuration data at the top of the page is probably best placed in a config file (and no that is not my real username and password). Since I don’t anticipate these changing, I have opted to KISS it. There are two constructors. The parameterless constructor is used by the MVC framework to instantiate an instance of the controller. This constructor creates an instance of the “WordPressRepo” that we already discussed. The second controller is used by testing frameworks and allows a fake “IWordPressRepo” instance to be injected. There are two action methods on this controller: Post and Page. They are nearly identical except for the method called on the “IWordPressRepo” object. In both cases the “PostData” model returned by the “IWordPressRepo” instance is injected into the “Post” view. First notice the view is using a master page. This provides the content for all the content surrounding the view. Also note that the generic ViewPage uses the PostData type for the model. After a bit of work, the end user of this web site can now create pages / posts in WordPress and have the content appear in the ‘home page’. This allows the content to be surrounded by other non-blog (think about the side bar that is typically in a blog…look to the right) content. This little bit of effort goes a long way towards making the site have a consistent and more professional appearance. I am currently developing an MVC4 .NET application and require integration into Word Press. Your article was very interesting but was written a few years ago. Is there anything additional I need to take into consideration for this to work with MVC4?